The most highly anticipated fun-run-come-party arrived in Bangkok. All the way from the USA, the inaugural Skechers Blacklight RunTM Thailand welcomed more than 3,000 Glow Runners to Makkasan Airport Rail Link Station to the capital city on Saturday 17th June. Bringing together people from all walks of life, MC Teeto and MC Sosmile kicked off the pre-race party and activities on the Main Stage. 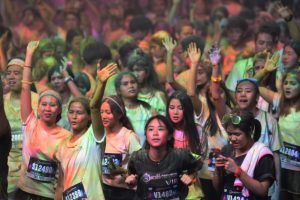 The 5km run route around Makkasan Airport Rail Link Station took runners through three Blacklight Run ZonesTM where everyone was showered in green, pink and orange non-toxic UV Neon Glow Powder. 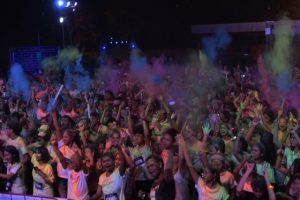 Once at the finish, the fun was ramped up further at the Skechers Blacklight Run After PartyTM. Covered from head to toe in the Blacklight RunTMpowder and glowing-in-the-dark, the 3,000+ participants were entertained by DJ Kennth G who flew in from Amsterdam to headline the event, and Thailand’s very own DJ Lady Punch. The Foam Wall – a first for Thailand – proved a big hit while the Celebration Glow Throws throughout the night kept the party going late, and to top it all off the K-Boy crew entertained on the Main Stage. 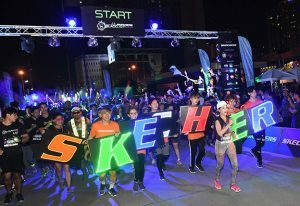 From children upto adults over 60 years old, and celebrities including Koi Ratchawin Wongviriya, all had a great time making the 2017 Skechers Blacklight RunTM Thailand a huge success. 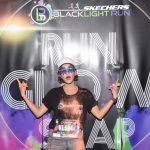 “We’ll be bringing a lot more #RunGlowSnap fun to Thailand in the future. Follow us on facebook for the latest news,” added Ting.